5 litre re-fill vessel available for bike shops - reducing packaging waste. Green Oil Wet Chain Lube has an easy to use and much imitated 'snap cap'. Simply twist and pull off in one go. It has a fantastic long nozzle, easy to get into hard to reach areas. A chain can be over 99% efficient in transferring energy from your pedaling to kinetic energy to drive the bike forward. ....The chain lube is brilliant stuff, it works just as a conventional lube, doesn’t leave too much residue if applied properly and of course won’t upset any wildlife while you are out on the trail. - Review by Mark Anslow, The Ecologist October 2007, page 69. - The Pro Cycling Wish List was compiled by Peter Cossins in Pro Cycling Issue 103, September 2007, page 124. - Click on the BikeRadar.com logo for the full review. - Lubes and Cleaners feature in Bike Biz January 2008, page 51. - 'Eco Hero' by Danny Carnegie in the Telegraph Magazine, 10th May 2008, page 77. As if cycling could get any more ecologically virtuous, we have found Green Oil for bicycle chains...It keeps those two wheels moving without the petrochemicals or Teflon. ...the point is, that this stuff is as green as you'll get. 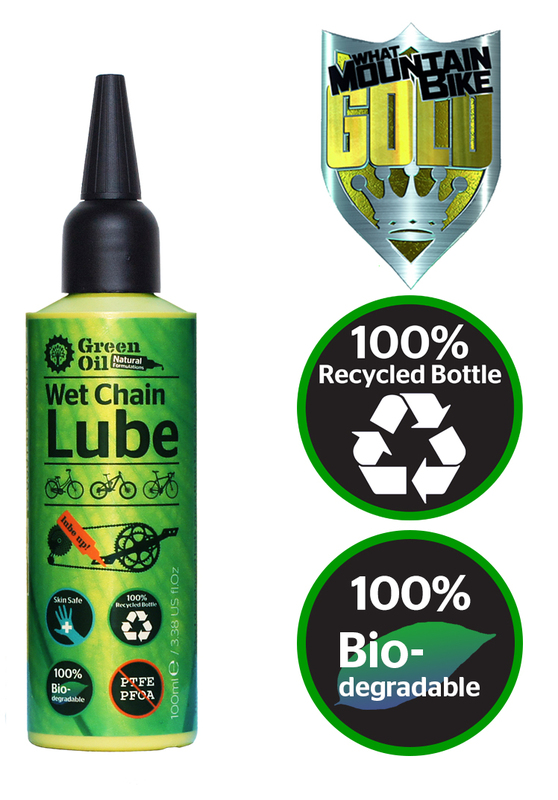 Unlike most other chain lubes this one doesn't contain any nasty petrochemicals and it's fully biodegradable....As they say, every little helps. - New Product review in Dirt Magazine, March 2008, page 73. ...Despite being biodegradable there's no worries about it not hanging about long enough to protect your chain. In use the oil is easily applied accurately thanks to the nozzle top and stood up to everything but the wettest winter rides without need for reapplication. - Result of a 3 month test in the the Grinder test section of Singletrack Magazine, June 2008, page 46. ...It works as well as regular toxic lubes too, keeping you spinning easier and greener than ever. - Review in MBUK's Wrecked & Rated section, July 2008, page 100. - Review by Peter Eland, in VeloVision Magazine June 2008, page 31. Click on the VeloVision logo for the full review. Aside from being environmentally friendly it lubricates as it should and I certainly think that my oil for the bikes in future will be nothing but Green Oil. What`s happened after 6 weeks and 750km all conditions riding (NONONO... I have ridden much more during the last 6 weeks, 750km is completed with my Unit)? Honestly? Nothing! There was no need taking care of my chain and chain lube, because Green Oil works brilliant. The lube is one of the best all conditions chain lube what I have ever used. - Review by Solozabi Bandli of 'Bicycle', Richmond Upon Thames. - Review by Carbon Neutral Expeditions, July 2008. (Yes it was reviewed in Cycle recently) I got some for Christmas. The guy deserves a medal. - Review by Carl on his Velophile blog, all the way down in Australia. Click for the full review. - Review by Rob Simmonds of Road.cc Click for the full review. - Review by Shaun Audane of Road.cc. Click for full review.